Konnyaku is recognized as extremely effective for the prevention of lifestyle diseases. It contributes to better health in many ways. Konnyaku has a high fluid content and is rich in a type of dietary fiber called glucomannan Glucomannan can not be broken down by digestive enzymes, so it goes directly to the intestines. 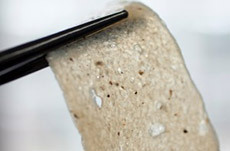 Thus it provides good nutrients for the cultivation of healthy becteria cultures. This helps provide a good balance of healthy cultures in the intestines, improving bowel motility and expelling.toxins from the body. Glucomannan also helps maintain good cholesterol levels by blocking cholesterol absorption in the small intestines. It is also effective in the prevention of diabetes by suppressing rapid absorption of glucose in the upper small bowels/intestines and blocking insulin secretion. 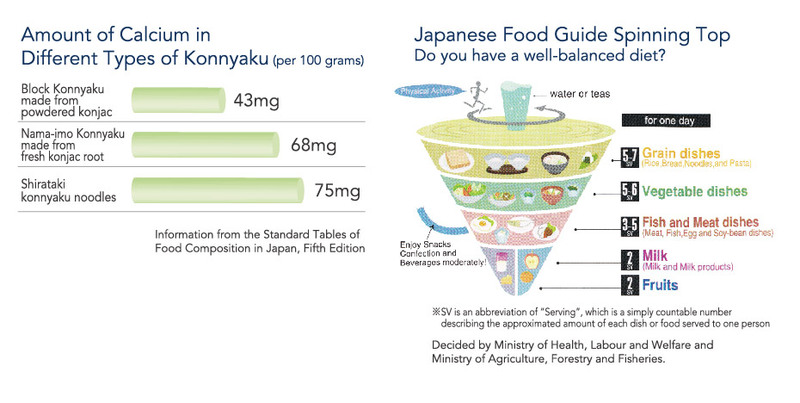 Konnyaku is not just a good source of dietary fiber and fluids. It’s also a good source of calcium. When you think of foods that are high in calcium, you tend to think of dairy products and small fish, but konnyaku is also high in calcium. Plus it also has the characteristic of being easily broken down by acids, which makes the calcium in konnyaku easily absorbable by the body. Thus konnyaku is helpful in the prevention of osteoporosis, for building strong bones and teeth, and for the suppression of irritability and temper problems. Lately people have been taking a fresh look at the importance of chewing ability, or mastication. When people eat nothing but soft foods, their jaw does not develop properly and their teeth falI out of alignment. The act of chewing also stimulates the brain, which aids in the brain development of children and in the prevention of mental deterioration in the elderly. Don’t just gulp konnyaku down when you eat it. You should improve the foundation of your jaw and teeth by enjoying the texturewith your teeth. 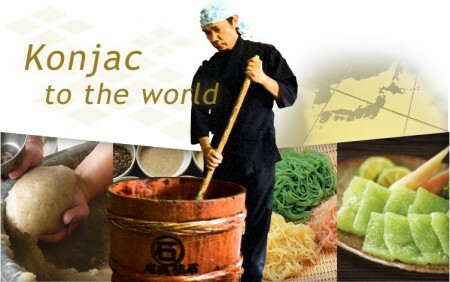 The basic ingredient of konnyaku is konjac, or devil’s tongue, from the konjac root. The konjac root is rich in ceramide, a component that preserves moisture in the skin. It is also suspected thatceramide might also help protect skin color through the suppression of melanin. Deficiencies in ceramide lead to problems such as atopic dermatitis and skin sensitivity problems brought on by dry skin. Lately, ceramide extracted from konjac root is being used in a wide variety of products including food and skincare products. 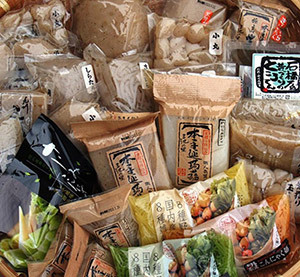 You can get beautiful skin by eating “nama-imo konnyaku”, which is konnyaku made directly from mashed konnyaku root rather than powdered root. Konnyaku is made from Konnyaku root(yam family)and containe glucomannan(natural dietary fiber). Glucomannan is natural dietary fiber, which cleans the digestive system by promoting the bowel movement. Glucomannan absorbs toxic substances produced during digestion thus preventing the toxins to be absorbed into the blood stream. The lack of dietary fiber is a major cause of the growing disorders such as; heart disease, high blood cholesterol level, gallstone, obesity, constipation and intestinal cancer. The benefit of dietary fiber is evidenced by lower blood cholesterol levels found in vegetarians versus levels found in carnivores. Glucomannan from Konnyaku is an ideal dietary fiber since it keeps cholesterol levels moderated. Obesity is caused by excessive energy (food) consumption. Since glucomannan has low caloric content and expends 30-50 times in the digestive system. Our body digests it slowly. It gives you the feeling of a full stomach while keeping calories low. Toxic substance, and prevents toxins to be absorbed into the body. Western countries lack dietary fiber in their diet, and there are higher incidents of large intestine cancer. Diabetes is a disease where insulin (hormone) in the blood lowers and blood sugar levels increase. 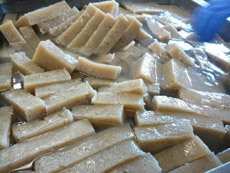 It is believed that a large consumption of Konnyaku lowers the blood sugar level by increasing the insulin production. Konnyaku contains acid-soluble calcium, which dissolves in the stomach and is absorbed in the small intestine, calcium is an alkaloid mineral, and this mineral is effective in counteracting the negative properties of acidic food, like meat.